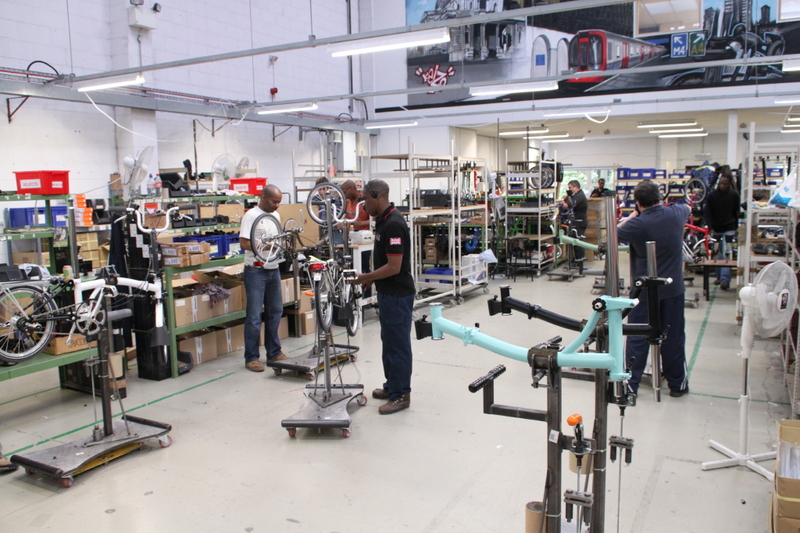 A busy crew assembles brand new Bromptons just for you. This fall my wife and I had the pleasure of visiting and touring the Brompton factory in England. I understand that tours were offered to the public in the past, but with this location and their quest to build the best folding bike without distractions, the tours are limited to dealers and VIPs. So with a little prodding to Bert at NYCeWheels, he managed to have the doors open up for us. Another great perk from my association with this great New York City folding bike shop. Ever since getting to experience the wonder that is Brompton, I have hoped a tour would be possible. One article I wrote for the NYCeWheels site, tells of the thrill it would be to get this tour and experience Europe on bicycles. Knowing that we had a vacation planned in this part of the world, the gears were set in motion. One of Bromptons’ great PR people, Hannah, helped to make this dream come true. We exited the train at Kew Bridge Station, a suburb of London. This quiet little town was much what we expected. A short walk on interesting streets lead us to the factory. While meeting Hannah and preparing to see the inner workings of the factory, my pulse was quickening. In the entrance hall, are some of the original Brompton prototypes and telling articles and photos about the development and history of the Brompton folding bike. Things were starting to heat up. Hannah was very welcoming and her smile added to the tour immensely. As she lead us into the first area of the shop, I could tell her knowledge about Bromptons was as strong as her love of them. We could see many happy workers going about their daily routine, and they too smiled and greeted us as we watched. They were busy creating Bromptons, so we mostly smiled, waved, and left them to their tasks at hand. As we saw each different area, Hannah explained the processes we were witnessing. The fine brazing, machining, and other things we were observing can only be explained as a work of art. Each person knew their duty, and tended to it with concentration and dedication. Many of the machines and tooling they used could be described as old-school, but each one had a purpose. Even the smallest of pieces were lovingly smoothed and checked one-by-one. The combination of man and machine was at its best in each work station we stopped at. I was beginning to realize that Hannah could probably create and build a Brompton herself. Her friendship with each worker and their job was obvious. As I photographed and wondered at everything going on before me, my attention to her wavered many times. I wish now that I had listened more carefully to her and all the Brompton wisdom she talked of. Even still, my time there was filled with wonder and excitement. If you are familiar with the Brompton folding bike, then you are sure to know that almost every part is one-off to fit a Brompton. Most all the pieces are made here. There are some pieces that they have made for them, and always to the exact specifications they require. Also, the painting is done in a different location. Everything is meticulously checked, regardless of its origin. It won’t be part of this bike unless the crew gives it a thumbs-up. We saw much quality assurance checking in many parts of the factory. The final assembly area was particularly interesting. As the bikes came together, once again the loving hands and minds of each person was evident. These are people who ride, think, and dream Brompton. They aren’t sending out any bikes that will sour their good feelings about the company that treats them so well. And all the cool colors in this part of the factory where easy to see as each bike took shape. Once the bike is complete, checked, and ready to ride, it is fully rechecked once again. A small crew of QC types scour each finished bike to make 100% sure that when you take ownership, it will be perfect. This is just one more reason that Bromptons continue to gain popularity world-wide. Then we saw them boxed and loaded onto trucks to be delivered to new Brompton owners, where ever they might be. 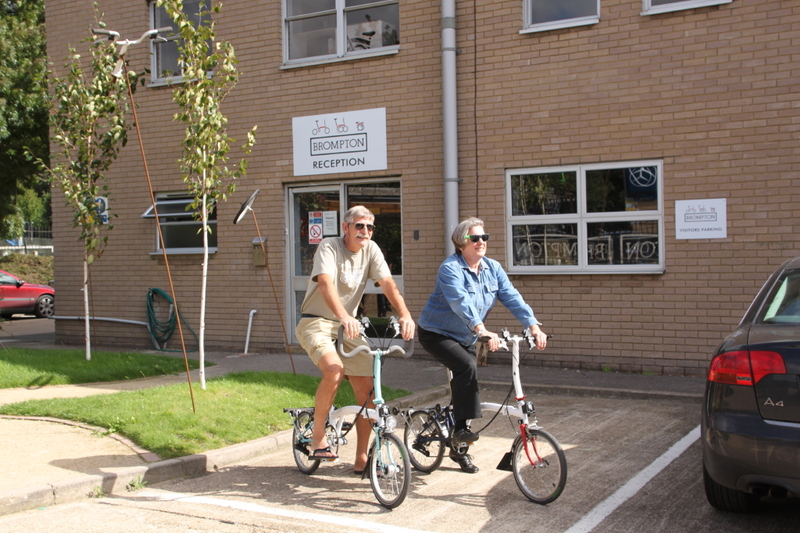 Barbara and I get to try out a couple of Bromptons in the beautiful English countryside. Once our tour inside was complete, Hannah brought out a couple bikes so we could get some photos with them in front of the factory. One was a red, white, and blue prototype. I thought that was fitting, as we had traveled from the US to see this UK powerhouse. Barbara and I agreed with had been treated so well by our English hosts. During this time, we had the pleasure to meet Andrew Ritchie, the designer and creator of the Brompton. With just a short conversation, he was off to deal with the day-to-day running of this busy place. I am sure he is very proud and appreciative of each and every person that crafts his great bike on a daily basis. And then, in too short a time, we were ready to continue our European vacation. I would have loved to stay longer and soak-up more time here. While on the train back to London, it hit me that I should have asked for a souvenir of our visit, but the memories and photos will be more than enough. So thanks to everyone at Brompton, Hannah in particular, and Bert at NYCeWheels for this great opportunity. It was a once-in-a-lifetime experience that won’t be forgotten. Even if you can’t tour the factory, you can enjoy the fruits of their labor everyday of the week. A Brompton can make such a difference in your life, and you owe it to yourself to find out how. Thanks for reading, Turbo. “I took care of my wheel as one would look after a Rolls Royce. If it needed repairs I always brought it to the same shop on Myrtle Ave run by a guy named Ed Perry. He handled the bike with kid gloves, you might say. He would always see to it that neither the front nor back wheel wobbled. Often he would do a job for me without pay, because, as he put it, he never saw a man so in love with his bike as I was.”—Henry Miller, My Bike and Other Friends. I wrote another article about our visit, you can find it at this link. You can find Brompton on the web, Facebook, and at better bike shops around the world. You can find NYCeWheels on the web, Facebook, because they are one of the better bike shops in this world. This entry was posted in Folding Bike test reviews, General bike stories, Opinion. Bookmark the permalink. I plan to visit London next month. Is it still possible to visit the factory right now? Calvin, I heard at the time that they weren’t accepting the general public for factory tours. We are FB members of the London Brompton Club and I have seen photos from a couple tours they have taken recently. Your best bet is to message to the factory (I am sure they have a contact address on their website) to see if they will welcome you. If can go I would love to hear how you liked it. Remember, the Brompton factory is in Kew Bridge, about 45 minutes north of London on the train. There are some other cool things to see in that part of town too. Bob, thank you for your information. I just send a message to Brompton factory, and wait for their reply. Is there a retail store next to the factory? Not when we were there. There are more than a few bikes shops in London that carry and rent Bromptons. Also, Cycle Heaven at York Station has a great selection of Bromptons too. If you go there, say hi from us. We stayed in York to see the National Rail Museum and enjoyed the town immensely. We are flattered to hear that you enjoy your Brompton so much that you also would like to visit the factory during your visit to London. I am sorry to say that we are not currently booking any factory visits. The most important reason for this is that our production line is running every day of the week and the space inside our factory is quite small. Because brazers are working with direct flames there is a safety concern for any member of the public who might be present. That’s too bad! If I go to Cycle Heaven, I will say hi for you! Thank you anyway!